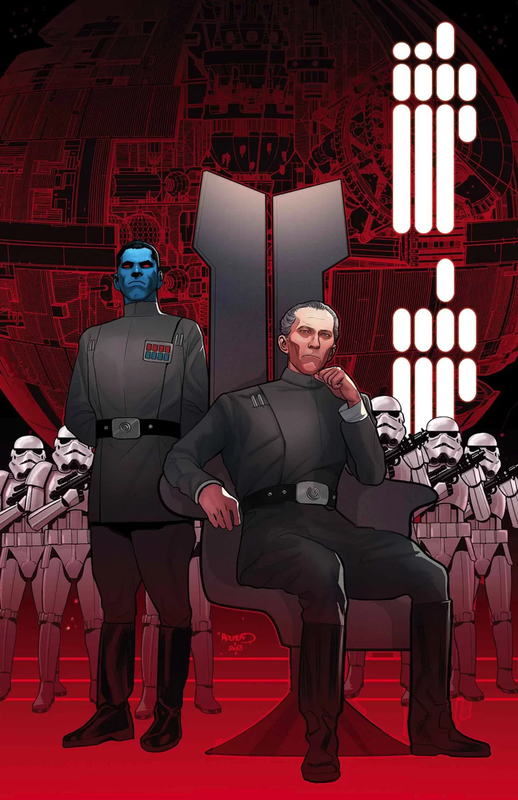 With some strong visuals, Thrawn #4 finally starts to pay off. While the story is still just an adaptation of the novel, this issue is a fun chunk of the story. Houser does an excellent job of fitting it all in and editing it down to the essentials. All in all, this issue is worth checking out. The story starts out with some scene jumping as it sets the stage for Nightswans and the various run ins Thrawn has had with him. It also sets the stage for the events on Cyphar. Once again Thrawn deals with a situation, this time a dispute between the alien natives and some human settlers. At the heart of the dispute is ore smuggling operation with Nightswan’s involvement. The story sticks to the book, but Luke Ross has some fun digging into the visuals of the story. There’s some nice shots of the characters, some great panels of Thrawn, and some good environmental shots. The aliens looking really wild. Plus Nolan Woodard does a fantastic job with the coloring and lighting which looks gorgeous in some of the panels. While the overall feel still has some of that muted, grainy, 80’s style, other panels are much clearer and great stand outs. There’s also a really great collage page near the end showing a bunch of events all melded together into one full page with no panel bars. While the art isn’t perfect, I definitely found myself enjoying the style of the artwork better in this one than past issues. Great work by the artists in stepping up their game. The story ends with Thrawn moving on to the next crisis. In this case, it’s Batonn. With two more issues to go, it’ll be interesting to see how much more of the story they can cram into this adaptation. It’ll also be interesting to see if the art team can keep up the pace and pull out some more great panels. As is, I give Thrawn #4 a four out of five metal bikinis. I really enjoyed this issue, which isn’t something I can say about some of the previous ones. Hopefully this series can end with enough positives to make it worth checking out.